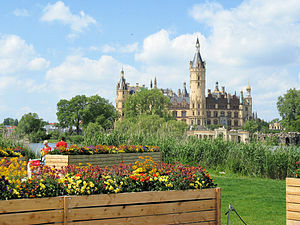 Bundesgartenschau 2009 – Raised bed gardening in front of the castle in Schwerin, Mecklenburg-Vorpommern, Germany (Photo credit: Wikipedia) So THIS is what they are supposed to look like, eh? … at least as far as it has gone. Yesterday on Hill Gardening Blues, our fearless non-gardener decided about 160 pounds into 240 pounds of topsoil that the frustration and ineptness displayed while making raised bed boxes was not going to miraculously go away. And that no matter how hard I tried, my raised beds were not going to remotely resemble the picture to the right here. Oh, and while we are at it, my house … although a castle of sorts to me … will never resemble the picture either. But then, mine are made out of wood, too. And actually, my wood does look a lot like the wood in the picture. Does that count? And as the sun set in the West yesterday, all was well here at Casa Chaos … and dreams of dirt miraculously filling the boxes, courtesy of my neighbor’s son, filled my brain. Flash forward to this morning. No industrious neighbors son. Time passes. No industrious neighbors son. Almost noon and there is the sound of voices outside the house. Intrepid Non-Gardener opens one of the large windows in the front room and says Hi. “We’re going to go to church now, but as soon as we get back from that, we will both be over to work on the boxes.” Super Neighbor says. “I have all the tools I’ll need to shore these things up and make the third one you wanted.” he said. So, as promised, a few hours later Super Neighbor and Son showed up in the front of the house again. While Dad took some lumber over to his driveway to work on it, Son cranked up a gas-powered weed eater and cut down everything that had grown outside the boxes. This was a good thing. The next thing I knew the front box, which had until this morning been one board width tall, was now extended down to the grade below nicely … and some of the dirt has been filled in. Oh, and one of the Holly bushes has been planted. Head slap. It is Memorial Day Weekend for all those of you who have a life. “That’s fine. I am grateful for any help I can get with this.” she said knowing she was paying hourly. “You’ll want to pick up another 4 10-foot boards so we can make it all even.” he added. 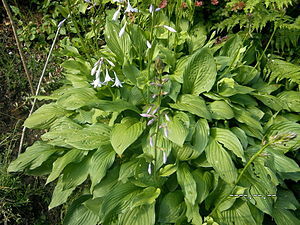 English: Plant, Hosta spec. Deutsch: Funkie, Hosta spec. (Photo credit: Wikipedia) Hey, any plant with Funkie in its description can’t be all bad, right? Well, if my neighbor can do it and my other neighbor can do it … I am sure I can do it. OK. Sorry. Was just ducking away for a minute in case I was struck by lightning for saying such a ludicrous thing. After all, we are talking about the person here who got a blue ribbon in 4-H … for explaining why the marigolds didn’t come up. And who killed a Coleus … repeatedly … that plant that anyone can have survive. And who, upon saying to my daughter that I was going to give her the mother-in-law plant that had survived twenty years since her birth, had it die away in a week. And the same person who … well I won’t bore you with details, but suffice it to say when I pull up to a gardening center, the plants shudder and do their best to hide. So … Hostas … with white flowers? How well do they grow for people without green thumbs? And do they really come up year after year? That would be nice. Stay tuned for more in the never-ending saga of Non Green Thumbs and Chaos. Hostas do come up year after year, twice the size of the year before! Its a favorite plant in this area as it likes the climate so that’s why I got a few bulbs. Which came up and then I noticed neighbors with really huge hostas. Then, my hostas came back up again this year, and oh my gosh, took up twice the space. Easy to grow and leave extra space around them. Thanks for the info Kris! Maybe they will work for me, too. I spent the afternoon after the guys left for the day painting … well, priming … the foundation of the house. This old place is going to look better than ever when all is said and done. Pictures tomorrow … or the day after. Wow, you’re so industrious. I’m trying to get up the gumption to go work in the backyard again!